Physical Computing – Scratch for Arduino, where as the name says, I explored how to use Scratch and Arduino to interact with the physical world. Here, we will learn the new version of Scratch, the 2.0, exploring some new and exciting projects. How to integrate animations and the Physical world. As we know, Scratch is a great tool to teach beginners how to code, but before starting our tutorial, I really recommend that you go familiarize yourself with the Scratch 2.0 language, following some basic tutorials. Doing that will help you to better understand how to use a Raspberry Pi for Physical Computing. 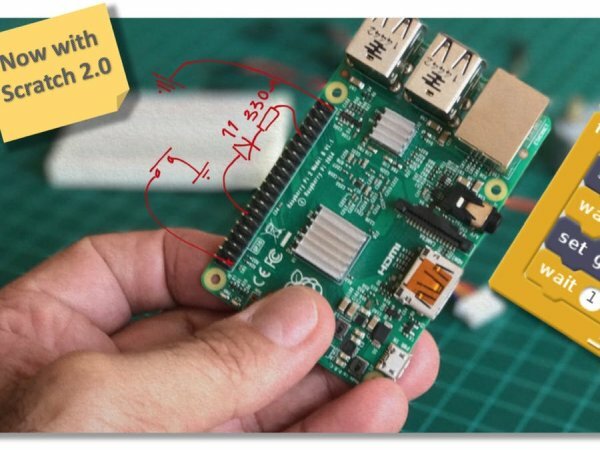 A new offline Scratch 2 version started to be delivered bundled with the last Raspbian OS release, and it is really great, with several new features that will help you to create a more professional codification. WARNING: At least with me, the actual version introduced some “freezing issues”, that could be related with Flash. Those freezings appeard whe I tried to upload new background or sprits. When you have the Pixel desktop in front of you, go to left up corner Application Menu (the “Raspberry Pi logo”) and open it. You will find as one of the options: “Programming“. Open it and click on “Scratch 2” (note that the old version Scratch 1.4 (named as “Scratch“) is also there. Once you open the Scratch program, you will get the screen shown above. The PI GPIO library will be installed and the “green led” shows that it is running properly. 2 news blocks will be now available to be used with your Physical Computing programs. “True” or “False” depending on GPIO digital level (“True = 1” and “False = 0”). Scratch 2.0 also allows the creation of custom blocks, allowing code to be encapsulated and used (possibly multiple times) in a project. We will see how to do it in the examples. Our Raspberry Pi will be running with the latest Raspbian version of the Operational System, having PIXEL, as our desktop environment. Pin Numbering Important to mention that we will use Broadcom (BCM) pin numbering for the GPIO pins, as opposed to physical (BOARD) numbering. Any pin marked “GPIO” in the above diagram can be used as a pin number. For example, if a LED was attached to “GPIO13” (physical pin 33) you would specify the pin number as 13 and not “33”. t’s time for the “Hello World” of Physical Computing, the “blink of a LED”! 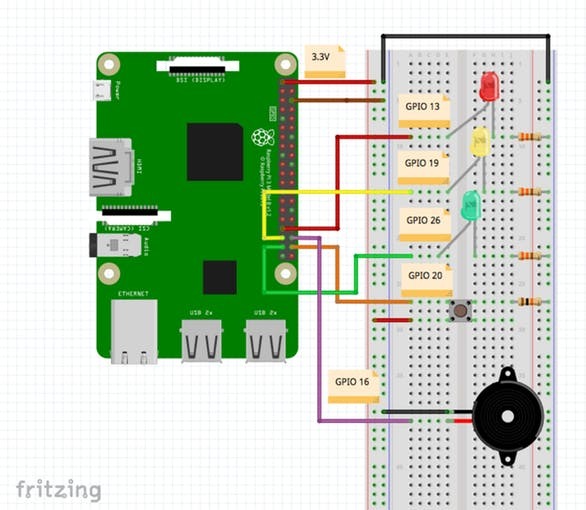 Let’s start connecting a LED to GPIO 13 of our Raspberry Pi (RPi, for short). Now, let’s create a real blink code using Scratch 2.